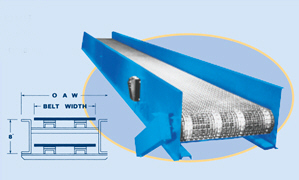 Wire Mesh Belt Conveyors - Roll-A-Way Conveyors Inc. The wire mesh belt is virtually impervious to extreme heat and cold, and thus can transport components through ovens or freezers. For use in dry operations, scrap handling, and steam cleaning. 1/2 HP 115/1/60 Motor ▪ 10 Ga. Construction ▪ 1” x 1” x 1/2” Wire Mesh Galv. Belt ▪ 6” Cast Iron Sprocket ▪ 60 FPM ▪ UHMW Wear Strips ▪ Capacity: 450 lbs.